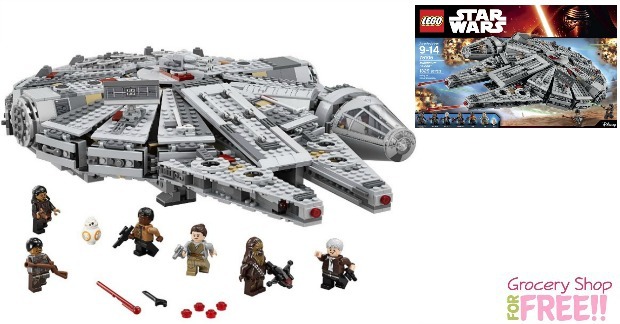 LEGO Star Wars Millennium Falcon Just $95.99! Was $150! PLUS FREE Shipping! You are here: Home / Great Deals / Amazon Deals / LEGO Star Wars Millennium Falcon Just $95.99! Was $150! PLUS FREE Shipping! Walmart has a LEGO Star Wars Millennium Falcon for $95.99 normally $149.99! PLUS FREE shipping! You can compare it to Walmart where they have it for $119! One of the most iconic starships from Star Wars is back and the LEGO Star Wars Millennium Falcon 75105 is tougher than ever before. It was featured in exciting new scenes from Star Wars: The Force Awakens. This latest LEGO version of the Millennium Falcon is crammed with new and updated external features. This includes an even more streamlined and detailed design. The detachable cockpit has space for two minifigures because no pilot should be alone. This kids’ play set has dual spring-loaded shooters, sensor dish, ramp and an entrance hatch ideal for imaginary fun. Open the hull plates to reveal even more new and updated details inside, including the main hold with seating area and holochess board. Another fantastic update is the even more detailed hyperdrive for any pocket-sized pilot on a mission. The secret compartment, extra boxes and cables, and storage for spring-loaded shooter ammo will help its legendary crew aboard the ship. Of course no LEGO Millennium Falcon model would be complete without crew members. Rey, Finn, Han Solo, Chewbacca, Tasu Leech and a Kanjiklub Gang Member, plus a BB-8 Astromech Droid are on board. This LEGO Star Wars Millennium Falcon 75105 is an excellent gift for space fans, so activate the hyperdrive and head for LEGO Star Wars fun.